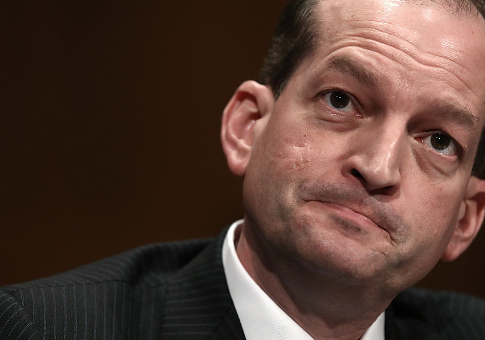 Labor Secretary Alexander Acosta said regulators must take liberty into consideration rather than the dollar figures associated with rule-making. Acosta has spearheaded a regulatory rollback in the department as part of President Donald Trump's deregulation agenda to jumpstart the economy. At a Thursday meeting with reporters, Acosta credited those efforts with "unleashing economic optimism," pointing to a record-high stock market numbers and low unemployment at 4.1 percent. He acknowledged there are still major hurdles to overcome in 2018, with the labor participation rate below 70 percent and GDP growth—above 3 percent in each of the last two quarters—continuing to outpace wage growth, which is only 2.5 percent on the year. He said the department can address those issues by changing its approach to regulation. Government agencies generally assess rules by doing cost-benefit analyses. He wants to broaden the scope to focus on the principle of liberty and the intangibles of lost—or increased—opportunity. "The cost to liberty also matters … often it's overlooked," he said. He pointed to the department's decision to kill President Barack Obama's "persuaded rule," which would have forced companies to disclose the names of law firms or consultants they turn to for advice in union elections. While the rule would not cost much in terms of figures, critics said it would have a chilling effect for lawyers and employers. "What is the cost to liberty in our society if a lawyer has to register with the federal government to give advice?" he said. Acosta has taken aim at occupational licensing in past addresses to state lawmakers and plans to bolster the case for consortium building across state lines. He sees low mobility as an obstacle to wage growth particularly among trade workers. A hair stylist in one state may avoid moving or drop out of the labor force altogether if they are forced to apply for a new license, which can require lengthy hours of unpaid training along with fees. "This hits mid-size workers particularly hard … and also hits spouses particularly hard," he said. "A lot of skilled individuals are giving up careers … to preserve the integrity of the family unit" by following a spouse's job transfer. Although it is a state issue, he encouraged lawmakers to standardize job requirements, just as nearly all have done for medical doctor licensing. He said many industries are targeted without the safety concerns that come with medicine. Acosta mocked a new licensing regime in New York City that require dog-sitters to provide credentials before beginning operations. "You don't need a license to babysit, but you do need a license to dog-sitters," he said. The department's biggest task in the near future is executing a Trump executive order to develop a new program aimed at boosting apprenticeships and on-the-job training. There are approximately 6 million available jobs in the U.S. that remain vacant because companies are unable to find workers with the necessary skills or experience, according to Acosta. He said the "skills gap" can be addressed by shifting to "demand-driven education." "We are not educating to the skills employers are demanding," he said. Acosta's apprenticeship task force, made up of labor, manufacturers, and other policymakers, is expected to release a report in the spring. This entry was posted in Issues and tagged Alexander Acosta, Regulation, Secretary of Labor. Bookmark the permalink.